"About 70 engineers, researchers and drillers will spend almost a month at Mallik this winter, drilling down 1,300 metres to test techniques to depressurize hydrates." molecules that trap the methane gas." "The site on Mallik Bay is arguably the best described and best characterized deposits in the world, Applejohn said." "About a kilometer underneath that rig is 113.3 billion cubic metres of methane, frozen in an ice-like state under about 600 metres of permafrost." "As a fuel, methane is much cleaner burning than gasoline or oil. If countries like Japan could tap into gas hydrates they could significantly reduce their greenhouse gas emissions." 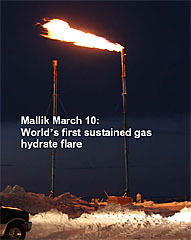 "The 2008 testing program at Mallik confirmed that continuous gas flow ranging from 2000 to 4000 m3/day was maintained throughout the course of the six-day (139-hour) test." .... "six days consecutive gas production with the depressurization method was achieved."